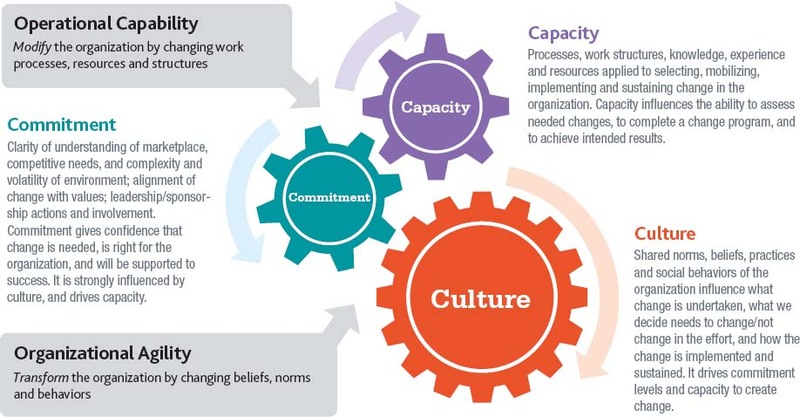 When looking at undertaking a major change in any organisation, how the organisation transforms and the level of success achieved depends upon what the people – all the people – are prepared to give up to allow the new approach to become embedded. Figure: Drivers of Organisational Change Ability (after Coombe 2014 – Change Agility; Readiness for Strategy Implementation. It takes 13 minutes and is well worth your time. Martin Danoesastro speaks about the factors required to take on board to achieve a flexible, focussed and rapid approach to meeting customer needs profitably in an ever more complex and rapidly moving market place. This is independent of the sector the organisation serves. Key points made are that to achieve this; a move to a working methodology that puts all the skills necessary for a product/service launch must be placed within a small, tightly knit team, which is allowed to operate within the larger organisation. It is empowered to deliver directly to customers. The organisation’s senior management needs to supply the why and the what as sponsors, then stand back and let the teams have their ‘head’. Middle managers have to take on board enormous change from being tellers of what to do, to ‘coaches’. This questioning is crucial to successful implementation of a transformational change. It is what interim executives can do due to their independence from the ‘old’ way of doing things and their laser focus on achieving the goals.